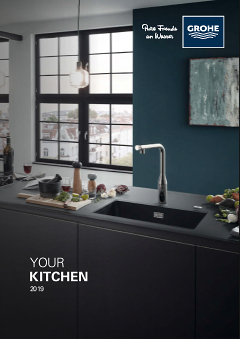 The GROHE Minta sink mixer transforms kitchen work into a pleasure. With its attractive minimalistic design and convenient features, it is a perfect match for any kitchen. It comes with a high C-shaped spout that swivels in a 360° range to maximize your operating radius, which is ideal if you've got a sink with two basins or wish to fill several pots in succession. The pull-down shower head will reach all corners of your basin without difficulty. To wash fruit or clean the basin, you can easily switch between a fine spray jet and a powerful shower jet. With a lever that moves super smoothly thanks to the integrated GROHE SilkMove technology, the control of water volume and temperature is effortless and precise. A perfect kitchen upgrade!